Disclaimer: This post is coming from the slightly OCD Renata that once brought you trailer textiles and a camper fridgie. What can I say? I get focused on one thing and beat it to death. I’ll clean the bathrooms some other week; right now my energy is consumed with Camper. It’s not a bad life, really. First, I got stuck under a grumpy 2-year-old at my computer and needed something to do while I sat there and held him. So I created a camper graphic to put on a new yard sign for our campground. Here it is. Then today I found these totally awesome mid-century Samsonite suitcases at an antiques/junk store and bought them because I’m traveling by air on a trip next month and clearly I needed these old blue cases to avoid confusing my luggage with everyone else’s on the conveyor belt. The wheels and handle still work perfectly, the lining is intact, the keys were included, and the metal is shiny and perfect. I get the feeling they were mostly stored instead of used. The original “Ladies’ and Men’s Packing Guide” was still tucked into the big one, advising me to “use shoemitts of fabric” to pack my shoes. I swooned, because I’m into that kind of thing, you know? The original Samsonite tag was also still on the big case, never inscribed, but I think I’ll tuck it away with my packing guide for posterity and decided to make my own instead. 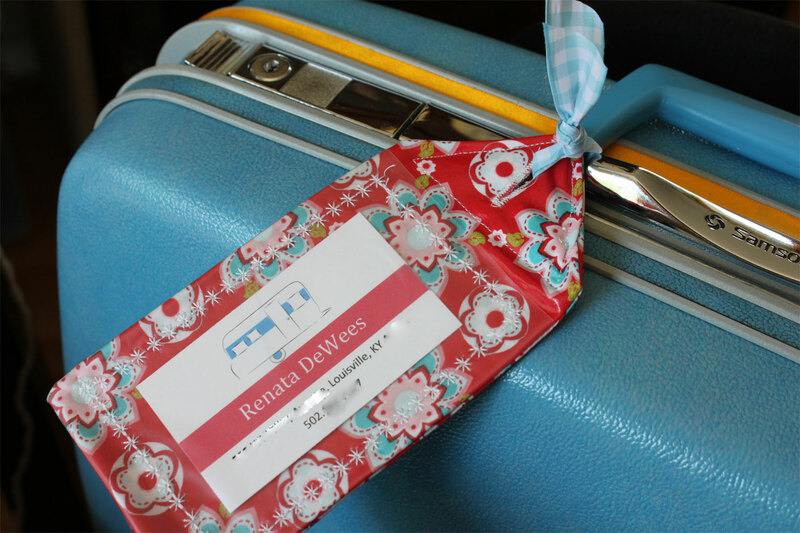 I went to print out the card to tuck into my new homemade luggage tag (the fabric is a laminated cotton) but couldn’t find a design that seemed right on the Avery website, although I often find really great printables there. Then it struck me that this was an excellent opportunity to use my own new graphic, so I designed a card with it and stitched it in. I think it looks perfect, and now I’ll have a little piece of my camper with me as comfort when I’m trying not to vomit at 32000 feet. (Campers=good; flying=bad.) Then I decided that my children need t-shirts with the same graphic (don’t they though?) and maybe even me too. So I headed over to Cafe Press, where I discovered that it is cheaper for me to offer my own graphic as an item for sale and subsequently buy it myself than it is for me to just privately design and purchase my own product. Sort of annoying. But why not? 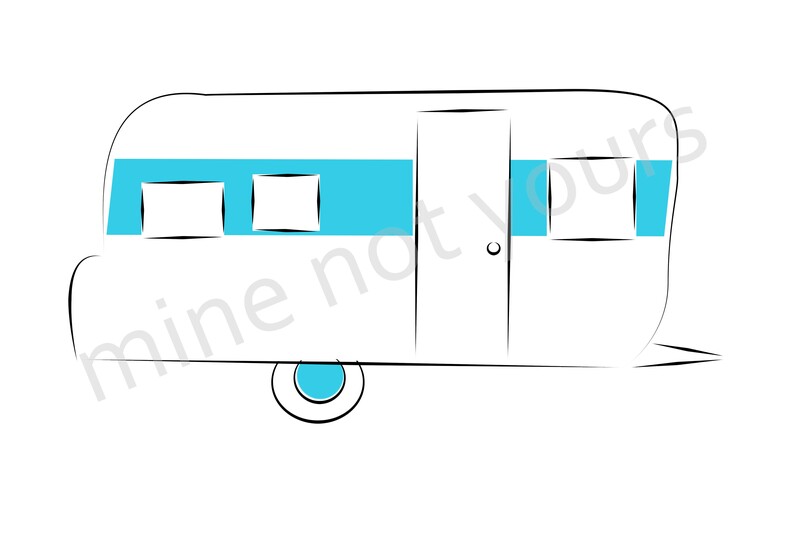 Most of my search engine traffic here is from people who google campers, so maybe they need Renata-designed camper merchandise too, right? So in case you happen to fall into that category here is the link to my brand-new Cafe Press store, where you too can join the vintage-camper-graphic-wearing crowd. Or something. Who knows what’s next? Maybe I can convince Cafe Press to start offering fridgies.